Pioneers in the industry, we offer v band clamp from India. We specialize in Manufacturing and Exporters a wide range of V Band Clamps which are performance engineered for long term durability and manufactured to the highest quality standards. 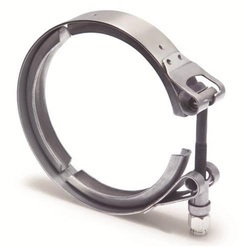 V Band clamps provide fast, secure coupling for connecting flanged joints. The V-Band clamp features high strength and positive sealing integrity. Looking for V Band Clamp ?